European governments should regard immigration as an "enrichment" not a threat, EU Justice Commissioner Franco Frattini told a conference in Lisbon. Mr Frattini said he would outline proposals next month for a "blue card" system for skilled immigrants, modelled on the US green card. He said the US was getting 55% of all skilled migrants, and Europe only 5%. "Skills shortages are already noticeable in a number of sectors and they will tend to increase," he said. Mr Frattini has long argued that Europe needs policies to encourage legal migration, and to prevent illegal migration. However, the European Commission's plans could be resisted by a number of European governments, which want to maintain national control over migration flows. Opinion polls suggest that as few as four out of 10 EU citizens believe immigrants make a big contribution to society. Mr Frattini said Europe needed a "new vision". The EU's working age population would be in decline by 2011, he said, and by 2050 a third of the bloc's population would be over 65. "All skill levels are required. 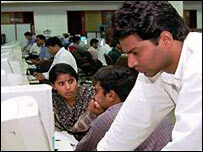 The challenge is to attract the workers needed to fill specific gaps," he said. About 4% of the EU resident population was made up of non-EU citizens in 2006. The blue card would entitle skilled workers to live and work in a given EU member state for an initial period of two years. Later, they would be able to move to another EU state. Portugal, which currently holds the EU presidency, is planning an EU-Africa summit in December, at which immigration will be a central theme. Last year, the EU began maritime patrols to turn back migrants trying to reach Europe from Africa by sea. Another policy is to negotiate re-admission agreements with African governments, so that illegal migrants can be returned to the country they left before entering the EU. In May, Mr Frattini proposed tough penalties for employers who hired migrants without a residence permit. But correspondents say this policy too could be resisted by member states, some of which do not want the European Commission to become involved in questions of criminal law.